AVID CTO, Paul Gelhausen, weighs in on the importance of new FAA ruling for small UAS. Engineered UAV technology is a process and a responsibility we owe to our community - no guesswork allowed. My dinner on Friday night was ruined by a toy remote controlled quad-copter. Nothing bad happened, but the total disregard for the FAA rules of aviation safety and the obvious ignorance of physics by everyone involved took away my appetite. Someone could have been hurt. The restaurant broke the law. It's unfortunate that most of the people in attendance, did not see the issue, but rather enjoyed the novelty. 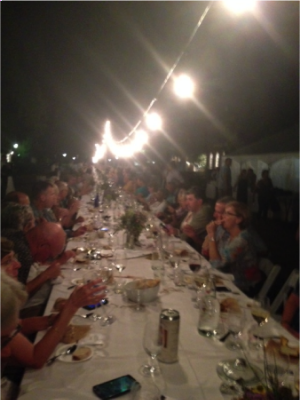 The scene was the “Farm to Table” dinner put on by the Trellis restaurant in Williamsburg, Virginia. The food was good. The company was better. There were about 300 people served at one long string of tables on Duke of Gloucester Street, another 50 people cooking and serving, and countless end-of-summer tourists on the sidewalks without tickets. The Trellis hired someone to fly a hobby-grade drone around the venue gathering video footage for marketing material. Other than being completely illegal - what could be the harm in flying an open-rotor DJI phantom 10 feet above the tables? What could possibly go wrong? It flew so close to us that I had to grab things to keep them from flying off the table in the downwash. I did not see safety in action. While I did not ask the operator to see their 333 exemption, pilots license, Class II medical, inquire where the qualified safety observer was, or mention there was an airport within 5 miles; I did report the incident to the FAA's Aviation Safety Hotline. Herein lies the problem and unfairness of hobby-grade drones used in place of professionally engineered unmanned vehicle systems. A professionally engineered UAV would not have been allowed by the FAA to perform that scenario, nor at a cost the Trellis restaurant would have tolerated. might have resulted with the Trellis (and perhaps the operator) incurring a fine - but next day - they could be in the air again. Hobby-grade drones are toys. They can’t be sold with geo-fencing because it is more expensive, difficult to update, and the hobby operators don’t want it. Professionally engineered UAVs can easily be programmed to not fly where they should not. It is better for the business to put safety first because of liability concerns, public perception, and common decency. The systems that we build as an industry should be safe. AVID’s control system has geo-fencing in its core to preclude this happening. The ducted fan UAV is clearly safer for operations around non-participants, but nobody should have a vehicle hovering over them. Tolerating rogue hobby-grade drone operations, while punishing real aviation, is not the way to build the market. As a community, we need to educate the public about safety and regulations. The FAA needs to open up the doors for safe operations so that the industry can move forward to do the jobs we should. When it comes to safety, payload, and scalability, the ducted-fan UAV is incomparably better than quad-rotor UAVs. The FAA's release of the Notice of Proposed Rule Making (NPRM) is a good first step toward commercial UAV operations. FAA Issued COAs will allow AVID to fly EDF-8 in civil airspace under Federal Aviation Administration guildelines.